If you’ve been looking for a recipe that shows off the bright, brilliant flavors of both strawberries and rhubarbs, that looks gorgeous on the plate and, of course, is lip-smackingly delicious, look no further. It’s so good that Kian has asked if he could have one, all to himself, for his birthday. I think I can make that happen. Preheat oven to 400-degrees F. Press dough into bottom and up sides of a 10-inch removable-bottom tart pan. Line bottom of dough with a piece of foil; arrange pie weights or dried beans on foil. Bake for 5 minutes, remove pie weights and foil and bake an additional 5 minutes until lightly browned. Cool on a wire rack. Combine rhubarb, 1/2 cup sugar, cornstarch, water, and 1/2 teaspoon cinnamon in a medium saucepan. Bring to a boil; reduce heat, and simmer 5 minutes or until rhubarb is tender, stirring frequently. Remove from heat, and stir in strawberries. 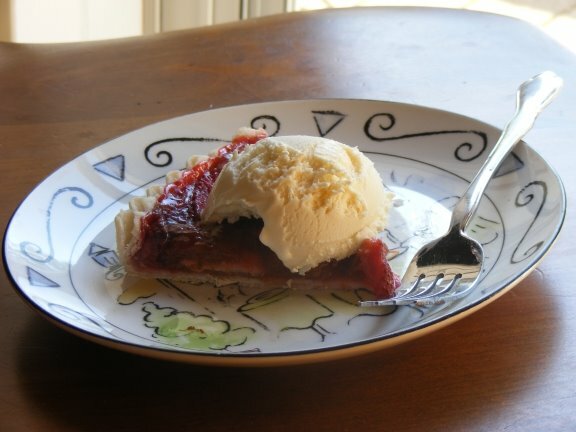 Spoon strawberry mixture into prepared crust. Combine 1/4 teaspoon cinnamon and 1 tablespoon of sugar; sprinkle evenly over tart. Place tart on a baking sheet. Bake for 30 minutes or until filling is set. Cool on a wire rack.